In the parable above that Jesus tells after the sinful woman has anointed his feet, he likens the person who is a sinner to one who is a debtor. He also does this in the parable of the unmerciful servant, who has a debt to the king that he can never repay (Matt 18:23-35). It is interesting to relate this idea to another one that Jesus used in his ministry – the Year of Jubilee. During the Year of Jubilee in Israel, all debts were to be forgiven, and any land that a family had been forced to sell in a time of famine could be reclaimed by them. It is interesting that the prophets and rabbis connected this thought of the year of Jubilee with the coming of the Messiah. In fact, one of Jesus’ first public statements about his ministry was to quote Isaiah 61, which says that he was anointed to proclaim “the year of the Lord’s favor,” meaning, the Jubilee year (Luke 4:19). 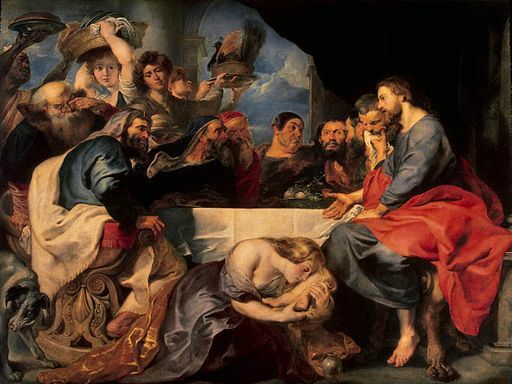 Through Jesus’ use of the image of the Jubilee, we can see God’s enormous grace – those who have been forgiven the greatest debt, like the sinful woman in the painting, love the most in return. It is good news to the “poor in spirit,” the humble and contrite of heart who see the need to be forgiven of sin (Isaiah 66:2). Through Jesus’ gift on the cross, those who will become a part of his Kingdom receive a forgiveness of debt far greater than they could pay themselves, and a chance to start over with life anew. ← I’m Glad I’m Not Like Him!